Holographic Versatile Disc (HVD) is an optical disc technology still in the research stage, which would greatly increase storage over Blue-Ray and HD DVD optical disc systems. It employs a technique known as collinear holography, whereby two lasers, one red and one blue-green, are collimated in a single beam. Current optical storage saves one bit per pulse, and the HVD alliance hopes to improve this efficiency with capabilities of around 60,000 bits per pulse. The HVD has a transfer rate of 1 gigabit/sec. A hologram is a recording of the optical interference pattern that forms at the intersection of two coherent optical beams. Typically, light from a single laser is split into two paths, the signal path and the reference path.. The beam that propagates along the signal path carries information, whereas the reference is designed to be simple to produce. A common reference beam is a plane wave: a light beam that propagates without converging or diverging. The two paths are overlapped on the holographic medium and the interference pattern between the two beams is recorded. A key property of this interferometric recording is that when it is illuminated by a readout beam, the signal beam is reproduced. In effect, some of the light is diffracted from the readout beam to “reconstruct” a weak copy of the signal beam. If the signal beam was created by reflecting light off a 3D object, then the reconstructed hologram makes the 3D object appear behind the holographic medium. 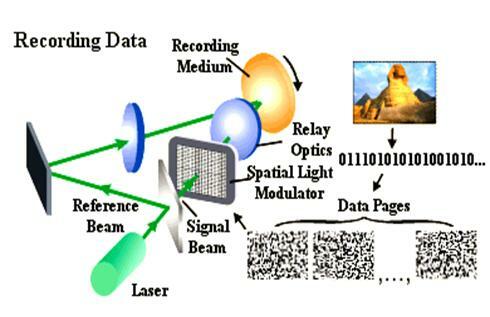 When the hologram is recorded in a thin material, the readout beam can differ from the reference beam used for recording and the scene will still appear. When the blue-green argon laser is fired, a beam splitter creates two beams. One beam, called the object or signal beam , will go straight, bounce off one mirror and travel through a spatial-light modulator (SLM). An SLM is a Liquid crystal display (LCD) that shows pages of raw binary data as clear and dark boxes. In order to retrieve and reconstruct the holographic page of data stored in the crystal, the reference beam is shined into the crystal at exactly the same angle at which it entered to store that page of data. Each page of data is stored in a different area of the crystal, based on the angle at which the reference beam strikes it. During reconstruction , the beam will be diffracted by the crystal to allow the recreation of the original page that was stored. This reconstructed page is then projected onto the charge-coupled device (CCD) camera, which interprets and forwards the digital information to a computer.